With the exception of late ground in Cape Breton, the risk for new primary Monilinia infections has passed. If an infection has occurred over the last three weeks and the timing of the blight spray was off, you should be starting to see symptoms on the plants. This is a picture from last year where you can see Monilinia infection on the flowers and the leaves. We are rapidly moving into bloom, with many areas in central Nova Scotia at or above 20% open flower. 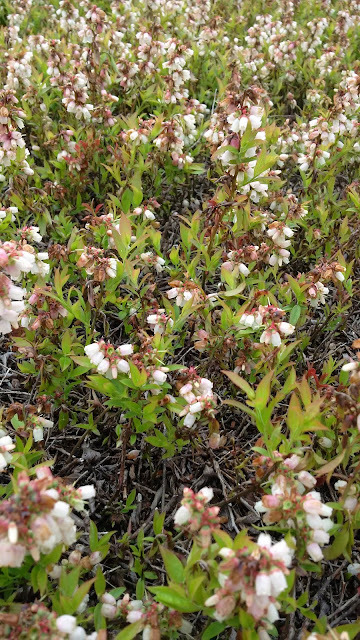 This is an ideal time to consider a first Botrytis spray, particularly if wet conditions are in the forecast. Not all fields in Nova Scotia have a history of significant Botrytis blight or other secondary crop year diseases like Septoria. However, you can find low levels of Botrytis in just about every field in Nova Scotia. If weather conditions are wet and warm, it can lead to significant infections in any area of the province. This will be the last Monilinia update for 2018, but I will continue to make updates for Botrytis Tuesday and Friday of next week and other updates throughout the summer.